The German Foundation for comparative product testing ("Stiftung Warentest") tested blood pressure instruments (see issue 01/2008 of "Test-Heft" Stiftung Warentest). 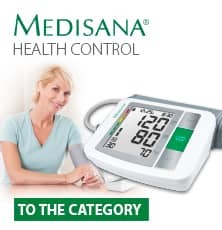 Among 10 wrist blood pressure instruments the "boso-medistar S" got the best score. Likewise the "boso-medicus familiy" achieved the best result among the tested upper arm instruments. This result is just another proof for the excellent quality and accuracy of the BOSCH + SOHN blood pressure instruments.